Leverage Tech Data's StreamOne platform to create a customer experience that matches your business model. Seamlessly connect all cloud services for easier provisioning, billing, and management. 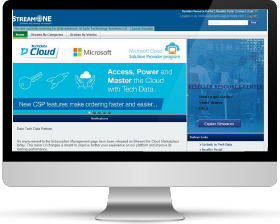 Access StreamOne Cloud Marketplace and StreamOne Enterprise Solutions datasheets for more details. The StreamOne Cloud Marketplace (SCM) helps you to learn, buy, and manage a broad range of subscription services on behalf of your end-users. StreamOne Enterprise Solutions (SES) provides added capabilities for complex IaaS and PaaS workloads with robust billing and management tools for partners and their end customers. Looking for greater control and visibility to optimize AWS and Azure usage? StreamOne CloudCheckr Analytics and Management Services extent platform capabilities with enhanced cost, security, and performance management tools. Our Partners may select one of two CloudCheckr packages for AWS and/or Azure. Ready to see how StreamOne supports your business?